Eric Robson and the team are in the Horsham District, West Sussex. Matt Biggs, Pippa Greenwood and Bob Flowerdew are on hand to answer the questions from keen gardeners. This week, they discuss using seaweed as a mulch, what to plant in a large pot, and how to deal with large quantities of compost. They also help gardeners with saving plants from vine weevils and dealing with damage to a tree from hornets, and consider what flowers they would visualise after a yoga class. 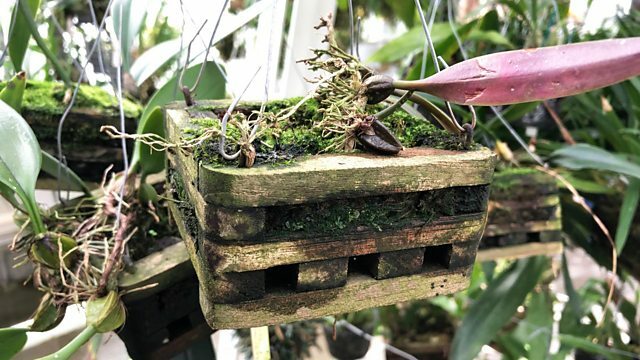 James Wong heads to Kew Gardens in London to speak to Orchid expert Bala Kompalli and finds out more about this exotic plant family which has over 28,000 species. Q – Does seaweed need to be washed before applying as a mulch? Bob – Provided it is fairly clean the salt will be no problem if you were going to use it on an asparagus bed which would be perfect, or beetroot and cabbage which would all like the salt. I would put it in the compost heap to break it down first or mix it with leaves and make a leaf mould and use that. Q – I would like to plant up some large pots for my new small garden. I would like advice on planting combinations which will look good and will be hardy enough to last until spring. Pippa – I am very fond of pieris. Incorporate bulbs such as spring flowering bulbs like crocus, dwarf narcissus, snowdrops, and even herbaceous plants around the outside like the heuchera for instance. Matt – Coloured stemmed cornus. Variegated ivy which will bring colour. Hellebores planted around and underneath, and even carex like ‘Frosted Curls’. Keep it simple with one centrepiece. Bob – Sweet Williams (Dianthus barbatus) or ‘Sweet Wivelsfield’. Q – We produce large quantities of compost, but nobody is able to do the heavy work of turning it. If we use an accelerator would that achieve the heat and killing of the weed seeds? Bob – That won’t kill the weed seeds but you can kill them before you put them in. Put them in a bucket of water for 5-6 weeks as the seeds rot. Hen manure or chicken droppings they would also make it go. Pippa – Think about insulating it, you can encourage the heat to build up in there. Q – Which flower would you like to visualise after a yoga class and why? Matt – Epiphyllum Oxypetalum ‘Queen of the Night’ - the fragrance is incredible. If not the crushed fruit of Vitis Vinifera ‘Common Grape Vine’ in a glass. Q - I love Heuchera but I keep losing them to the dreaded vine weevil grubs – I have used nematodes but can you suggest something else to save my plants? Pippa – Hanging baskets will help, vine weevil are great climbers, but they can’t fly. If you put something around the bracket this will help stop them passing. If they are plants in containers and you know the compost doesn’t have vine weevil in it you can stand the pots on pot feet, and then stand the pot feet in a deep tray which you keep topped up in water as vine weevil’s can’t swim. I do think nematodes are the best answer, combine that with mulch on the surface around plants in the garden and containers. Q – This year hornets stripped rings of bark from a lilac tree in my garden, what damage does this do to the tree and what can I do to stop them? Matt – If they have girdled the whole plant and gone all the way round then chances the tree will die at least above the girdling. If there is anything that remains that allow connect between the root and the rest of the plant, then you may find it is likely to survive as they are tough plants. In the area that is girdled wrap clingfilm around the area to keep it moist. Q – Could the panel tell me the difference between a damson and Bullace growing in the hedgerows? Bob – The wild plant which is a sloe which is quite bitter and doesn’t have much connection to the domesticated plants. The Damson is from the far east and has the damask flavour with a spiciness to it and slightly round in shape. The bullace tend to be more oval and related to the wild plum, they come in purple white and orange.